He is known for his humor and his unusual props when he speaks to teenagers about faith, but Dave Gehrich still elicited more than a few “Can you believe he’s doing this? !” looks when he gave a talk about people’s relationships with God while standing behind a shower curtain. Gehrich figured the shower curtain would get the full attention of the high school students on retreat, and he was right. Still, there was a deeper purpose to using the prop. He wanted a visible way to show the barriers that people often put up in their relationships with God. “I pointed out to the group that they could see me, they could hear me, but they could never touch me,” says Gehrich, a popular speaker at archdiocesan events for youths. “As long as I kept that barrier between us, we could never have a complete relationship. So it is with their relationship with God. At the end of the talk, the high school seniors were encouraged to participate in the sacrament of reconciliation. Most of them did, some for the first time in years. “They wanted to drop that layer keeping them from their Lord,” Gehrich says. The picture of Gehrich behind a shower curtain is part of the portrait of one of the most interesting youth ministers in the archdiocese. 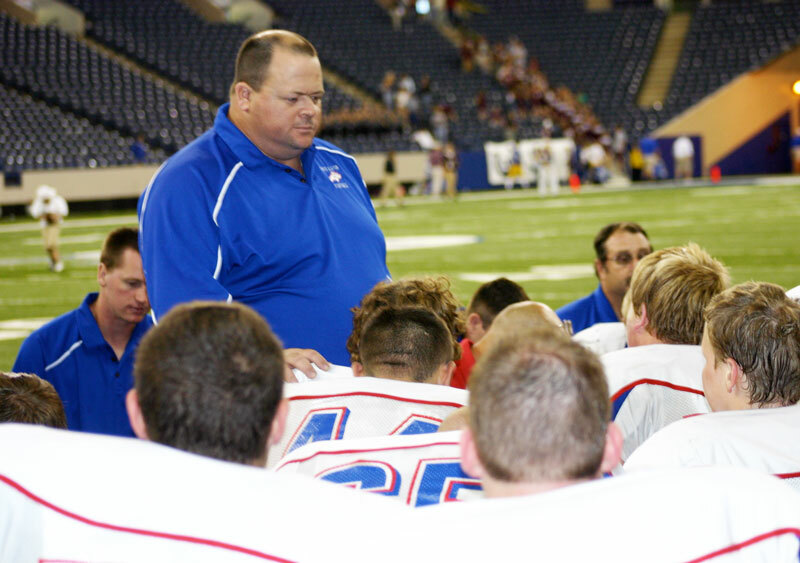 Now the coordinator of youth ministry at St. Maurice Parish in Decatur County, the 45-year-old Gehrich is also a chaplain for a high school football team and uses Facebook to connect with players. The father of three is also a former fallen-away Catholic. Here’s just how far he once had fallen away: He would drive his then-small children to religious education classes on a Sunday morning, walk them to the classroom, and return to his car in the church parking lot, where he would read the newspaper instead of attending Mass. Then one moment changed his faith and his life—a moment that could be described as pulling back the curtain of his relationship with God. That moment involved his wife of 23 years, Angie. “On Holy Saturday night, I was sitting in the church and watching the most important person in my life get baptized. I said to myself, ‘You’re a real idiot. You’ve been raised in the Church, and you didn’t do anything with it.’ I had no value of it. She saw the value of it. She took the risk to become a Catholic. Even at 45, Gehrich has a natural affinity for teenagers. He views the teen years as a time when youths struggle with their doubts and fears while they try to find their place in the world. He remembers vividly his own struggles as a youth, especially dealing with the jokes and comments about him being overweight. Gehrich helps build that trust and helps lead teenagers to a deeper understanding of their faith, says Kay Scoville, the archdiocese’s director of youth ministry. One of Gehrich’s biggest fans is his daughter, Megan. As a 20-year-old college student, it wouldn’t be unusual if she distanced herself from her father. Instead, she has followed him in trying to bring young people closer to Christ. She often gives talks at the same conferences where her dad speaks. She was there the time he gave his talk behind a shower curtain. Gehrich’s different approach to youth ministry is revealed in his role as the chaplain of the football team at North Decatur High School in Greensburg. “We pray before every game in the locker room, and we pray on the field after the game, including the cheerleaders, the band members and the fans in the stands,” he says. For Gehrich, the use of technology is a perfect way to connect the Catholic faith to young people. “These kids are just addicted to Facebook,” he says. “Why? It’s all designed to satisfy the need to be loved or accepted. Teenagers want to be part of a community. Well, what is the Catholic Church? It’s a great community. We can use technology to share our faith. With my cell phone, I can send a text message saying, ‘I’m thinking of you and saying a prayer for you.’ With Facebook, we can have a Bible study among friends or put up a Bible passage. The choices people make about their faith is a constant theme for Gehrich, one that surfaced again when he gave a talk to more than 200 youths from across the archdiocese during “Consumed 2010,” a eucharistic retreat at Cathedral High School in Indianapolis on March 5-7. As he spoke about the topic of “Christ Crucified,” he had already placed a whip, a crown and a replica of a crucifixion nail on the table in front of him. For Gehrich, the answers are clear: God has created a cross for everyone, a cross that he wants each person to carry back to him. “God specifically created a cross for you so precise that it’s not one inch too long, not one ounce too heavy,” he told the youths. “You can be the toughest guy here today, and there’s a cross for you. You can be the quietest little girl here today, and there’s a cross for you. Gehrich embraces his cross and the Catholic faith he once lost. He rejoices in leading young people to Christ.